Project Run and Play: Giveaway---Blank Slate Patterns for Boys! 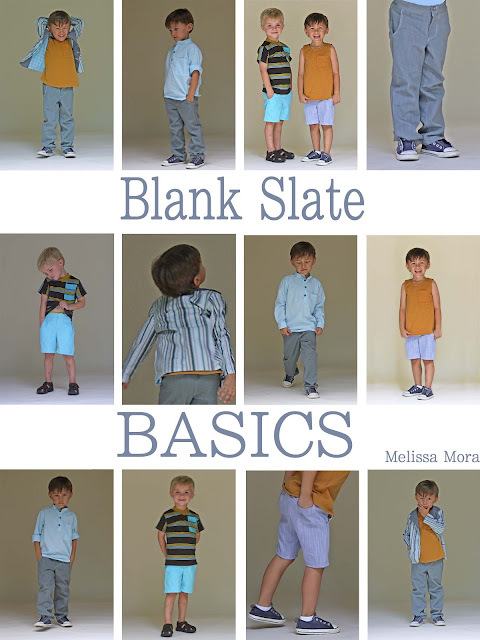 Giveaway---Blank Slate Patterns for Boys! Our giveaway today is from one of our former contestants, Melly Sews, who has launched her Blank Slate Pattern e-books for boys and now for girls as well. The book is chalk-full of great, basic patterns for boys. Her goal with this set of patterns is to give those who sew for boys a set of "Blank Slates" - the things boys wear all the time - so that you don't have to worry about drafting patterns or take the time to do so, you can skip right to expressing your creativity through fabric choice, embellishment and detail. Isn't that a great concept? She is so brilliant. Today, two lucky winners will receive Melissa's e-book that is worth $25. You can also view and purchase the individual patterns HERE. Just leave us a comment about a favorite thing you love to sew for boys---and you are in! We will pick two winners at random to receive Melissa's Blank Slate Basics patterns. This giveaway is now closed but you can always find Melly's Blank Slate Patterns on her site! I have two boys and I like to sew tees and sweaters for them, since they like knits. Pants also from time to time. I would really love to give these patterns a try ! I love sewing shorts for my little man...because he loves wearing shorts so much. Sadly it's getting colder so I need to get some trousers into his wardrobe. Thanks for a great giveaway. I love the blank slate...so many options! I love making clothes for my son out of old things of my hubby's. They get a new lease of life and it's always a fun challenge. I like to sew boy's quilts! Also, toys or pillows! This is the first giveaway I have tried for and I would love to get these patterns. I like making jackets for boys. So far I've only made a pair of pj pants for one of my nephews. I'd love to make more clothes for both of my nephews. Thanks for the giveaway! I love sewing fun pants for boys! I love these patterns...such a great collection with so many possibilities! Pants and hats. They are basics but can be done so many different ways. I would love to win this!!! Thanks for the chance. I've just purchased the girls' Blank Slate. My favourite thing to sew for boys is shorts. I love to sew for my nephew. Just finished a pair for corduroy pants and a hoodie...Love to sew overalls too! Tees, pants, pyjamas, shorts. . . I *love* sewing for boys. And I love these patterns. I love sewing clothes for boys from my husbands old clothes! I sew a lot of pants for my little man as he's tall and skinny and doesn't fit into store-bought pants very well! I have not ventured into clothes for my son, so this would help. I do love sewing car maps from felt for him and his friends! I love shorts and pants. This book looks awesome! 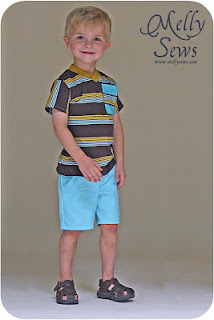 I love to sew little elastic waist pants and shorts from fun, boyish prints for my little boy to wear! I love sewng appliqués t-shirts! I've been eyeing Melly's pants pattern! I sew and sew and sew for my little girl - and I was just thinking that maybe her brother would like me to sew him something other than star wars pillow cases. :) I would love to win this book, and in the mean time think I will check out those patterns. I love to sew vests for my little man!! I love, well I wouldn't say LOVE, but I often sew dress clothes for my little boy because it's hard to find what I want/need in the stores. I love to sew vests, bow ties and knickers for my little guy. Who ever said sewing for boys is no fun must have never had a little boy! I haven't sewn anything for a boy, yet. My sister has a son who's almost one and I know she'd love to get her hands on some more patterns! I just made a corduroy vest and trouser set for my little man!! LOVE IT!! I have 4 boys and besides making superhero stuff, I frequently make shorts and shirts for them. Thank you for this great giveaway! I sew for my daughters and my niece all the time but I also have 5 nephews and would love to have patterns on hand to sew up something stylish and personalized for them. My 3 year boy idolises his big sister and wants to dress in pink all the time, so I spend my time making him shorts and T-shirts in patterns with enough pink to satisfy him but not so much that strangers in the street comment on my two beautiful daughters! I'd love the book to extend my repertoire for him. I should make some pants for my skinny guy, but mostly I end up making costumes. I have a dress-up fiend on my hands! I love to create shirts for boys, but I did make my son a cape for his birthday last year. I have two boys and desperately need this for them! I just botched two perfectly good pieces of clothing because of my self drafted patterns, help! I love making shirts for my boy! Sadly all I've made are bowties and hats so I would love to win these patterns! Thank you! Overalls and button-up shirts... mostly because I can make both in tractor fabric for my tractor-crazy nephew! I've been all about outerwear lately. Love me some blazers! I love sewing button ups for boys. So hard to find button ups without weird graphics or labels. I like making hats out of fleece or reconstructing old t-shirts into hats for baby and toddler boys. What a great giveaway! I love these patterns! They would be great to have. I like to make costumes for my little guy but I would really like to have a good pattern for making tshirts! These are great, it seems there are so few patterns for boys! I like making rompers, although he's outgrowing that sort of thing! 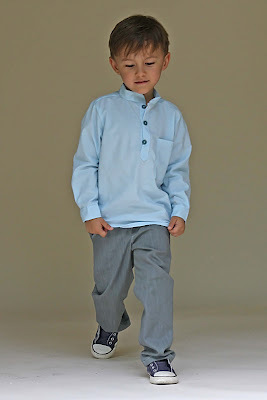 I don't have much experience sewing for boys, but I love how versatile these patterns are. I'd dress my girl any any of the items. Would love to try the cool cardigan! Shorts and pants are my favorite...I love to add funky pockets and embellishments or work with crazy fabric patterns. I would love to have Melly's book, it sounds like it's right up my alley! I love sewing clothes for my boys!!! I'm busy making a pair of modified London Pants from Petite Kids Boutique right now for my son. (yes, the pattern is now for sale there and it is lovely!) I'd love to win some more neat patterns to make for them! I love to sew pants. Thanks for a great giveaway!! I like sewing little suits-- nice dress clothes for boys are a lot harder to find than girl's! I usually sew toys for my nephews. Almost anything! My favorite was a suit I made last Easter. I've only sewed pants for boys and I really look forward to making some kind of top for my son. I think my favorite thing so far are overalls. Anything they need (well, I've yet to make a suit)! It's so satisfying to make it instead of buying it. I like making shirts for my little guys. I've been eyeing this bundle of patterns, but haven't gotten around to it yet. I love that little jacket! Thanks for the giveaway! Vests and little bow ties. I've done some pj pants! snuggly and comfy! Oh I need to win this! I've been wanting to get her patterns! My new favorite thing to sew after this week's challenge is knit t-shirts! So fun and easy especially if you use old adult shirts for the fabric. I love making little jackets! I have minimal boy sewing experience but I did make a fully lined coat for my nephew that's pretty cute albeit not my color choice. Thanks for the giveaway and the reminder to take a picture of said coat. ahem. I love making jackets, but most often make cool pants... Love the blank slate patterns! What a great idea! This ebook is definitely going on my wish-list. My favorite thing to make so far for my son was the Urban Hoodie by heidiandfinn. Pants are fun, too, cuz they look so darned cute on him. I'm am just about to enter the world of sewing for boys (I'm due in the next 3 weeks or so), and would love this to help me along! Great giveaway, thanks for the chance! I'm just entering the world of sewing for my son- he's 2.5 now. Pjs are high up on my favorite thing, since I know they'll get used, and he loves telling dad that "mommy sewed it." I've been dying to get my hands on Blank Slate Basics! What a great giveaway! I love making pants and shorts for my son. He's really tall for his age but super skinny and finding pants and shorts that fit him (even with an adjustable waist) is nearly impossible! I mostly sew pajama shorts and pants for my boys. I would love to make more for them! I like to sew vests for boys. This is horrible to say, but though I have two little boys, I rarely sew for them :-/. I sew for my daughter all the time. I'd love to change that! oh pick me! I have two little boys who look dapper in their homemade vests and bow ties. I would love to be able to add some blazers to their wardrobes! I love making shirts for my little guy! I love making pants for my very long legged and very skinny little guy so that he looks like he is wearing regular pants and not baggy clown pants! And shirts too, especially when I mess about with the direction of the print on the different pattern pieces!!! For boys, I am into sewing hats these days. Quick and easy. And useful! I havent tried making anything for boys yet so I look forward to trying. Thanks for the great giveaway! MEMEMEMEME, I want to win this sooooo bad!!!! I love making shirts - they are quick and turn out so cute - and someday I will start embellishing them to make them even more fun ;o) I'm struggling to get the right fit in pants I need to do a new pattern from scratch - orrrrrrrrrrrrrrrrrrrrr win Melly's AMAZING patterns. I like to sew interesting pants with patches, pockets, and unique details that aren't common on store bought pants. My 2 year-old is really digging pockets right now, so pockets on everything!! I haven't made much for my boys but these patterns would be great motivation to start! I haven't sewn very much for boys yet, but would love these patterns to get me started! I like sewing clothing that's unique. It's all in the details! My son loves to dress up, so I like to sew costumes for him. Love having the ability to make the things that my three year old asks for- usual very specific request. These patterns are nice that they are basic and can be built off of. I am not good at seing for my 3 year old and I would love to use this pattern to help me get a start on making his wardrobe! I love sewing pants for my boys. They're quick and satisfying and I love putting little surprises in them like quirky fabric in the waistband or fancy stitches around the cuffs. 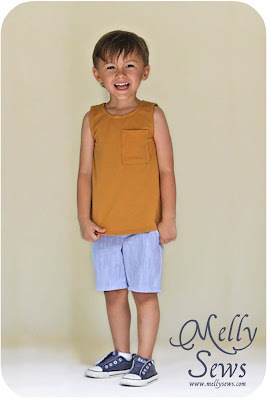 Love Melly Sews and it would be awesome to win this! I love making pajama pants and embroidering tee shirts for my little guys. I need to check out this pattern if I don't win it! Exactly what I have been looking for for my THREE little men. For little boys I love to sew comfy knit pants, and for bigger ones, sweater vest. And of course I'd love to win this group of patterns. Pajamas they are comfy and quick! I also am knee deep into Halloween Costumes but loving adding all the little details! The clothes are so cute! I enjoy sewing shorts for little boys (and girls too) the most. We live in the desert, so it is warm/hot for at least 6 months of the year! Dada and Son matching jammies! I haven't had a chance to sew too much for either of my guys but I recently resurrected the sewing machine and I would like to see what I can make! With two boys 8 years apart it is fun to make the odd matchy matchy outfit for them - with a twist! I recently discovered A Girl and a Glue Gun captain america and batman reverse applique tshirts! So wonderful and even my big boys loves it when he and his little bro and matched up! For this one the boys got a utility belt as well - the big boy had places for his sheild, throwing star (toys) etc the little one for his sippy cup and pacifier! I love boys! I love making pants for my boys but would love to add some reliable tops to the repertoire. Pants. I love making fun colors you can't really find at the store. Plus they're quick! I am relatively new to sewing clothing, but when my son started to become particular about how his clothes fit and feel I knew it was time to challenge myself to design clothing that he really enjoyed wearing. I am having so much fun! My only boy is pretty new, so I haven't sewn much for him yet, but I do like sewing pants. They're not too difficult (and thus easy to embellish because you haven't spent all your time on the main piece) and they're oh-so-useful! I don't have any boys (yet), but I love to sew boy things for my Etsy shop. I love to make button down shirts! I would so love to have this! I've made a few things for my boys and so far, their favorite (and mine) has been vests. They look so handsome! I have three grandsons; a fourth on the way in Dec. and the fifth grandchild is our first granddaughter also due in Dec. I was recently given a new Babylock Ellisimo machine and would love to have this book to work with. As you can tell I have lots of lil' models to sew for. I love to make shorts with coordinating shirts! Thanks for the chance to win! I love sewing pants for boys- but I also love to sew messenger bags for them. Either one gets filled with "treasures" from their boy adventures. I love sewing shorts for boys but would love to expand my skills and get creative with this e-book! I love sewing little bowties and vests for my boys. they look so dapper! I love making our coordinating easter outfits and I am in the process of making a pretty sweet Brobee costume (yo gabba gabba) that I made up as I went along. My son is still mastering walking, I've been sewing cute shoes to go with his outfits. How fun would it be to just do the whole outfit?! I love sewing shorts and pants for my skinny toddler - store clothes just won't stay up on him but a 12 month pattern with 2T length made by mom is PERFECT! Since my son is very tall and very slim, I love to make shorts and pants for him. I haven't started sewing for my son, but I am so excited to upcycle all his daddy's old shirts into hip clothes for him! Mostly I have just made them shorts! My son loves the wallet I made for him last Christmas. He's thin and getting taller all the time, so I'd love to sew him some shorts that actually fit! I love to make simple things, like t-shirts or vests, but add a contrasting or vibrant banding to make the item POP! I love to make pants for my two boys. It started out as a necessity as they were chunky little guys and wore cloth diapers and ready made items didn't fit! Now it's just for fun. These patterns look fantastic! I have 2 small boys and like sewing tops and teas as you have such a great blank canvas for personalising. I love to make trousers for my boys, and to embellish plain, store-bought T-shirts. These patterns look great, what a wonderful prize! I love sewing games and dinosaur tails, very cute and something they actually like! I like making shirts with cuffs and slacks with pleats. Hi! Love these patterns. Perfect for my "porotito" (as I like to say to my 2-year-old [we're from Argentina]). I like sewing t-shirts for him... they look just great. Since my boy is my youngest I haven't made him much but I have made him a cute little vest and pants. Looking forward to sewing more for him as he gets bigger. I love to make my son shirts from re-purposed men's shirts, as well as make-believe clothes. I am also thinking of tackling a suit sometime soon! What a fun giveaway!! I have made a dozen tie applique t shirts for my son, they are just such a crowd pleaser and so stinking cute. But I recently made him some pants from Made's pattern and would love to try some others. Thanks!! I haven't actually attempted to, but I'd love to sew shorts and pants for our boys. My favorite thing to make for boys is yet to be determined. We have two little girls and baby boy is due on Halloween! I would love to have a set of basic patterns from which to start. oh, i hope will be just on time. My favorite piece, never done or never finished, is a shirt, a white shirt, full of details, my son has 6 yo now and the shirt is size 4. So maybe will be good have a new project like that lovely blaser for my 2y.o second boy (yesterday was his birthday). I love sewing for my little girl and have made her some very cute stuff, but my son has only received one pair of pants from me that were huge on him and I have to admit that when it comes to sewing boy clothes I'm lacking. I would love to be able to make him more things so he doesn't feel slighted(because 8 month old babies feel slighted often lol) and winning these patterns would help me do that. I've actually never sewn garments for boys, Halloween costumes being the exception. I'd love to win this prize - what a great way to get started! I love to sew little boy ties and hoodies. So far it's just pants, but I would live to start making shirts bad jackets!!! pants/shorts are my top pick for my son. thanks for the giveaway! Wow, these are great entries! I like to sew jammies, undies and bow ties for my boys. Haven't really tried "real" clothes yet for them, but I think I'm going to jump in! I love sewing shirts for my boys. My grandson loves to dress up, so anything he can use to express his imagination, capes, crowns, tridents, masks you name it he has it. He's only 4 so we have loads of fun! I sew pj's and hats so far. This book would really help me expand my sewing for my boys. It is a great book! Dress-up clothes. The superhero cape (personalized to "Mr. G") and mask are, of course, his favorite. Man, sewing for boys can be easy or it can be tough. It all depends on what you want to make and I feel like everything I try is tough! I bet I would do well with a book like that... I do love to make nice pinstripe pants for Sundays for my boys. I love sewing lounge pants and shorts for my little boys!!! I've also made a few western shirts as well. I love to sew shorts and pjs with fun novelty fabric. But I think it's time to branch out and use solids! I would love to get this book! I spent 2 years learning how to make woman's clothes 30 years ago. Back then I used to make all my clothes. When my daughter was born 25 years ago, I made a lot of her clothes as well. Now I've got a brand new grandson and I am "learning" to sew again! I wish I had never stopped making clothes! There is so much I have forgotten over the years.. I have been making sleepers, pants and t-shirts for little Tylor and I would really like to get into making more clothes for him as he grows up. I like to sew him clothes, but he loves for me to sew him toys!! :) So far the pants I make trn out best. But I did do one shirt that I et compliments on all the time! I don't know if this is still open, but I would love this! I love to sew pants for my little guy, and he loves wearing them! My son is grown up, and I have to admit when he was little Most of my sewing for him was fancy sewing like smocked outfits until he outgrew them. Now I have a one year old grandson who doesn't go places a child would wearing smocked clothing. It's time for grandmama to take on basics. That is what he needs. Thank you for the chance. I only have boys, and clothes for them in the shops are soooo boring, so I like to make them bright funky T's. 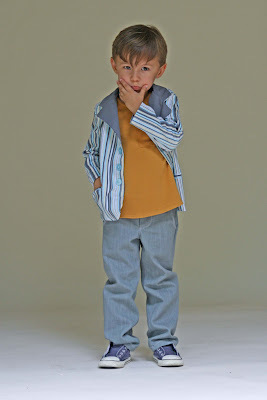 I love sewing pants for my little guy and have big aspirations of shirts for all seasons and coats! But everything has always been some sort of woven, no knits. I just got a serger for my birthday though, so hopefully that can change!! I haven't had much opportunity to sew for boys yet, but when I do I LOVE making shirts with ties/bow ties on the front. I just think they look so adorable in those. Plus, the moms love how comfy those shirts are. No constricting neck straps to worry about! I have mostly made baby clothes for my two grandsons. But they are both out of the baby stage now, and both are skinny and extra-long in back-length which leads to fitting problems, so I'm interested in making more of their clothes. I have never sewn for a boy but would love to start sewing for my son! I have three boys! I would love love love this! And I love the basics. Such a good place to start! I love sewing for boys, but my skills are rather simple, I've been too nervous to make my own patterns, this would be great to extend my skills in the basics - particularly as the idea of embellishing items to personalise them sounds like so much fun! Two words: Seer and Sucker. Little boys look so cute in it, and it doesn't wrinkle.